Important: There is NO quick fix to balancing low cortisol levels. You’ve probably heard “long term stress is bad for your health.” But that's pretty vague, right? Thousands of other things are “bad for your health”, so how is this different? This is what’s supposed to happen in your body when you get stressed. As a human, this is the kind of stress your ancestors lived with for thousands of years. And you're designed the same way - to handle short term stress. Do you notice a trend here? These are all everyday things that can keep you stressed all day long. And as a human, you weren't designed to handle long term or chronic stress. When you're stressed for longer periods of time, cortisol levels stay elevated. And it’s important to know that your body is designed to be a fine balanced machine. When cortisol levels increase above normal, this balance is thrown off and there are some major downsides. You may have even heard about the dangers of high cortisol in the mainstream media. I hear so many people worrying about high cortisol... and with good reason. Yikes! Remember, when you're stressed, your body thinks a lion is chasing you. It's only focused on survival and escaping the lion (or other stressor). So sleep, digesting food, burning fat, and fighting bacteria are all of a sudden not so important for your body. And you're smart enough to know that this isn't ideal in the longterm. However, despite all this, you may actually still feel pretty good with high cortisol levels! That's because cortisol increases energy, decreases inflammation, and can make you feel awake and alert for very long bouts of time. You can often still juggle whatever life throws at you with high cortisol levels, despite some nagging symptoms! But cortisol levels can't stay high forever - and that's when REAL problems begin. The crazy thing is, most of my clients’ lab tests are showing low cortisol levels and the effects of this are even worse. But before I tell you why low cortisol levels usually lead to even worse outcomes, I want you to understand why people end up with low cortisol levels. When you're stressed out for days, weeks, or months, your brain still thinks a lion is chasing you all day, everyday. Your brain keeps telling your adrenal glands to pump out more and more cortisol without giving time for rest. Think slave labor! When you fall into this pattern, two things happen. 1. First, your adrenal glands become physically EXHAUSTED and can’t keep up with the demand. Imagine driving your car over 100 mph for a really long time, or blasting your air conditioning non-stop in 200 degree heat. Eventually, something is gonna give… and the same goes for your body. Eventually, cortisol levels start to go down as the engine (your adrenal glands) burns out. 2. Second, your brain becomes DESENSITIZED to stress. This means that your brain thinks your body is crying wolf and that you actually aren't stressed all day, everyday. “How can a lion be chasing you for twelve hours a day, seven days a week? !” is what your brain asks your body. And so the normal stress response stops. So, at this point you’ve got exhausted adrenal glands, which can’t produce enough cortisol, AND you’ve got a confused brain that no longer knows how much cortisol the body should be producing! And this is a bad combination, assuming you care about your longterm health. This graph gives a clear picture of the path many people take when they go through a lot of stress. And this can include emotional stress, dietary stress, or even prolonged stress in the form of physical pain. LOW cortisol levels can make you feel even worse. When this happens, the high cortisol symptoms can STILL remain because your body continues to feel stressed, but the symptoms may have often gotten worse by this time. Yes, these symptoms can all add up. Because if you have low cortisol levels, your body is running on half (or less) of what your body was designed to run on, to function at an optimal level. This is so important, but so overlooked! It's known that cortisol is the body’s major anti-inflammatory hormone. And it's also known that almost all diseases are rooted in inflammation or closely tied to it. When cortisol levels are low, your body really struggles to handle inflammation. So if you’ve got low cortisol, plus your immune system is down from all the stress, you can see why this is not a good sign! That's why prednisone shots (which are like synthetic cortisol) are so effective in the short term! But these can have devastating side effects and can cause your body to stop producing cortisol on its own. Most doctors don’t know how to test for HEALTHY cortisol levels. And most doctors definitely don’t know how to restore the body’s normal cortisol output. There's no pharmaceutical drug that can do this! When conventional medicine doctors think about cortisol and the adrenal glands, they are only looking for extreme medical conditions, like Addison’s disease or Cushing’s disease. However, these are extremely rare and most people don’t suffer from them. Most doctors also don’t take into consideration that cortisol levels are supposed to change throughout the day. You're supposed to wake up with high levels, and they’re supposed to decline throughout the day. That's why it's so important to get your levels tested for an entire day. If you look at these lab results from my client, you can clearly see the imbalance. Not only were their total levels low, but their rhythm was like a roller coaster, rather than a nice smooth wave. And yes, this client could definitely feel the roller coaster of energy levels each day! This client also had sleeping problems, bloating with meals, and a lot of lower back pain. However, this client’s doctor said everything looked “normal” for their annual physical. And after working with me, we were able to reverse all the symptoms, and much more! With functional wellness, I'm not looking to diagnose any medical disease. I'm looking for dysfunction and imbalances that can cause the symptoms. In many cases, this includes imbalanced cortisol and other hormones. By addressing root causes and restoring optimal function of your body systems, you won’t believe how amazing you can start to feel! What do you do if your cortisol levels are high, and what do you do if they are low? There's a simple side to this, and also a more complex side. Let's start with the simple side first. Whether you have high or low cortisol levels, the most important thing you can do is decrease your stress levels. There are two big kinds of stressors to focus on decreasing. 1. Chemical and biochemical stressors. This means decreasing the stressful foods you eat, along with stressful chemicals you might be breathing in or putting on your skin. This means reducing processed foods as much as possible, such as breads, pizzas, pastas, and other frozen foods with really long ingredient lists (with lots of artificial ingredients too). It also means avoiding added sugars, as these stress out your hormones as well. Replace these foods with a lot of nutrient, healthy vegetables and sustainably raised, healthy animal proteins. Human beings are the only species that are smart enough to be able to control how we feel, just by changing out thoughts. And while our external environment and situation can definitely play a major role in our thinking, we ultimately have the power to choose our perspective and choose how we react to the situation. The more you can let go of anger, worry, fears, self-doubts and more, the faster you'll recover from any long-term stress imbalance. Every thought and emotion you feel has a physiological response in your body, and as it turns out, the negative emotions put you in 'fight or flight' mode, while the happier, peaceful emotions put you in 'rest and digest'. How to handle high vs. low cortisol levels? This is where it gets more complicated and you'll need a trained professional to make sure you're doing this properly. To get the fastest results possible through a program customized to your specific needs, I'd recommend working with someone who has experience in this field of helping others just like you. Natural supplements can work very well, but different supplemental programs fit different people, depending on how their circadian rhythm is. One person's optimal supplement plan may actually make someone else worse, because different people have very different imbalances. While reducing stress is a component, there are 6 other crucial steps to take if you want to live your life to the absolute fullest, without being held back by your health. And if you’re someone who’s ready to feel more joy, pleasure and fulfillment each day, while minimizing physical and emotional pains… then you’ll love to read my brand new e-book. It’s called, “7 Crucial Steps To Make Sure Life DOESN’T Slow Down As You Get Older (So You Can Have The Active, Healthy, Fulfilling Life Of Your Dreams). This e-book can truly serve as your guide to achieving the excellent health and happy, thriving life you’ve always dreamed of. Here’s what you’ll discover when you read this e-book. How my clients are losing 20, 30 and 40+ pounds without counting a single calorie or stepping foot inside a gym (and keeping the weight off! All you need to do is click the button below and then you’ll get instant access to the e-book today! 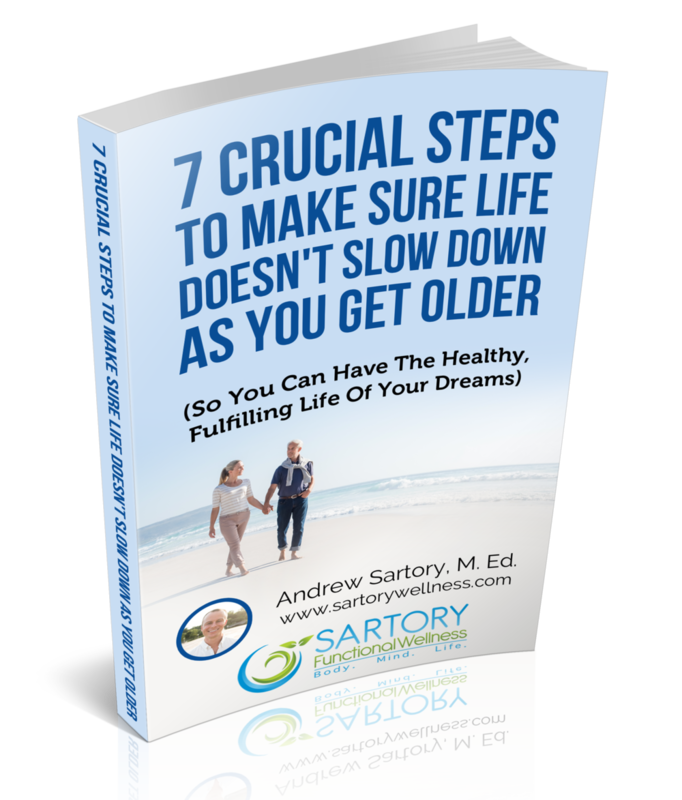 Reverse the effects of aging and feel more than ten years younger when you follow the 7 steps in the free eBook!